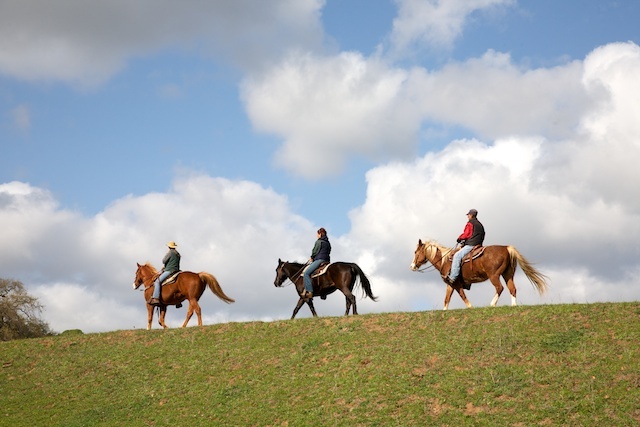 Triple Creek Horse Outfit offers a variety of ride lengths to suit our guests’ riding interests and schedules. Daily ride times vary. Our horses are saddled specifically for their reserved rider and rotated daily to insure a happy, healthy mount. All rides are guided and all prices are per person. – Please review our Rider Requirements first, and please note weight restrictions/limits. – For the following tours, please book below (additional descriptions at bottom of page) – Public Rides are 2-6 riders, Private Rides are 2-4 Riders, Inclusive Prices are for groups of 4 or more. Private Ride followed by Picnic Lunch at Jack London’s Cottage: 1 Hour ($185) 1.5 Hour ($210) and 2 Hour (285). Reservations for the above Private Specialty Rides’ availability and requests please email date/ride requested direct to triplecrik@gmail.com. – Some Ride times may be added/changed to calendar, email any special requests, and we will do our best to accommodate depending on availability. Gift Certificates are available. Visa and MasterCard accepted. Weight and age limitations may apply; please read our cancellation policy and our FAQs page for important information. Riders must be at least 8 years old and under 210 pounds. Children must be accompanied by an adult. Please note: The pace of any ride – Public or Private – is determined by the guide once ride has commenced and all riders’ abilities are observed. Trail and park conditions are also factors in determining the pace of each/any ride. Public Rides: May have up to 4-6 guests, and your guide. *Inclusive Rides: Includes a gratuity for the guide. This is applied to parties of 4 or more riders, and for third-party bookings (concierge, travel agents, etc.) and is an option available to all guests. *Private Rides: These rides have a 2-rider minimum, and is an exclusive ride with only your party and the guide. This is a popular option with both experienced riders and not-so-experienced guests who who want a more individualized ride. Private Lunch Rides: Very popular with our guests, offers a unique Wine Country dining experience. Enjoy your private lunch, mid-ride, under the canopy of towering California redwood trees. Great for proposals (all have said “yes,” so far…) anniversaries and small birthday gatherings. Corporate and Large Groups: Horseback riding can be great for team-building outings, wedding parties and family reunions. Please contact us for information, triplecrik@gmail.com. The maximum on one ride: 6 Guests – Cancellation policy for groups of 4 or more is 5 days. QUESTIONS? They may already be answered on our FAQ page, or email triplecrik@gmail.com. We’d be glad to chat, please email us and we’ll get right back to you!